Standard - $74.99 Only 9 left! Take command of any situation by teaming up with a comrade this Halloween! Not sure where to find one? Don't sweat it, we've got you covered! Just slip on this Comrade Piggyback Costume, and you'll have the illusion of riding on your pal's shoulders. With the two of you teamed up this Halloween, we're sure there's not much you can't handle! 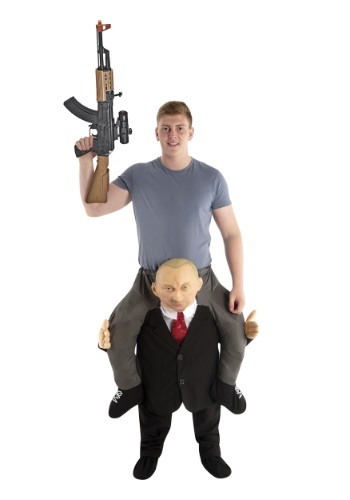 This Adult Comrade Piggyback Costume fits around the waist, and includes faux legs, hands, and a molded head, all to create the illusion that you're riding on a little fella. It has an elastic waistband to stay in place, and you can wear whatever clothing you'd like to complete the theme. You could also grab a toy gun, just like we have it pictured, if you're planning on a comrade takeover! While we've got great illusion costumes just like this Piggyback Costume, we also have tons of other zany styles, too. From super-sized inflatables to over-stuffed aliens, we've got costumes for any theme you can dream up. So, go on, shop our entire selection for yourself and check out some styles for your friends, too, if you're going for an epic group theme!